If you noticed some construction activity off the Northwest Arm Drive near new Long Lake Village community, I am happy to report it is the construction of a new five kilometer section of trails. The five kilometers of trail will go from Old Sambro Road and be joined with the existing trail that runs across the street from Peter Saulnier Drive (former Cowie Hill Connector). The existing trail will be upgraded to meet the standard of the new trail. The new trail will be about four metres wide, and when it is leveled it will have maximum grade limits (eight per cent), which will make it fully accessible. The surface will be gravel. The plan is to include wood chips alongside the parking lot to and along the sides of the trail. This will minimize the raw construction look from rocks and debris. 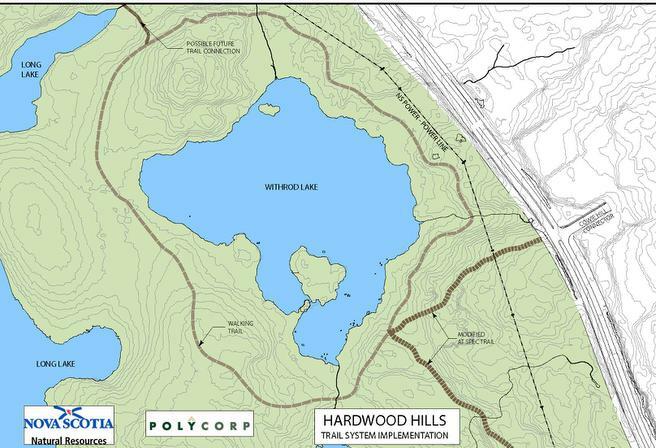 The trail will include a branch loop all the way around Withrod Lake. This is the lake that is visible from Northwest Arm Drive; Long Lake is set further back. Long Lake is no longer Halifax Water’s secondary water supply. The Chain of Lakes is the secondary water supply and the trail around it is signed with this information. There will be a driveway leading from Northwest Arm Drive, and a parking lot is being constructed that can hold 40 vehicles. The lot will not be visible until you are at the end of the driveway, so the natural aesthetics of the area will be maintained. There was no parking in this area as you cannot park on Northwest Arm Drive or Old Sambro Road. The new lot will enable residents to have safe access to the Long Lake Provincial Park. It will augment the other entrance off of the St. Margaret’s Bay Road. The traffic lights will have a new left turn added, when traveling north bound on Northwest Arm Drive. This project is made possible through a joint effort between Polycorp and Atlantic Developments, in consultation with a volunteer community organization, the Long Lake Provincial Park Association (LLPA). The LLPA will be managing it after the project is complete. Volunteers are needed for this exciting project; please contact the Chair, Donna Flemming at 902-430-3833 if you would like to volunteer. LLPA applied for and received a provincial grant of $40,000. They hired a consultant who developed a concept plan. The plan includes building a new trail at the intersection of Northwest Arm Drive and Old Sambro Road and a new, small parking area at Dentith Road. This trail will connect to the other new trail described above. The concept plan includes picnics areas, benches, pit privies for public use, garbage cans, doggie bags, and many other features including but not limited to a canoe/kayak launch and interpretative panels and signage. An accessible surface for the pumping station will provide a viewing terrace. It is my hope that we can have connectivity between the Chain of Lakes Trail and these new trail systems. The consultant determined an area where a connection could be made that would lead towards the St. Margaret’s Bay Road. HRM is undertaking an alignment/design study for the Northwest Arm Drive Greenway project which would involve connection from Northwest Arm Drive and St. Margaret’s Bay Road to the new Chain Lake Bridge. Long Lake would be an excellent candidate to add further trail connections.